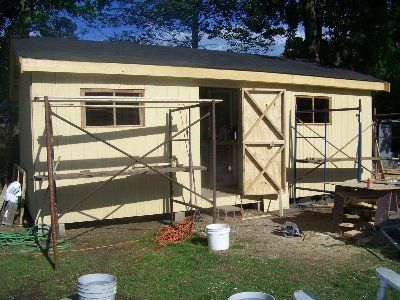 This is the old breeder coop, we built this first. 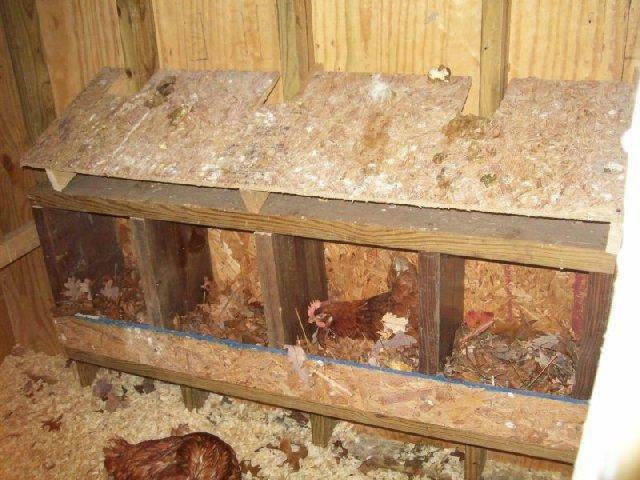 It has 3 pens on the left that have attached runs and 3 pens on top that we use for a brooder. 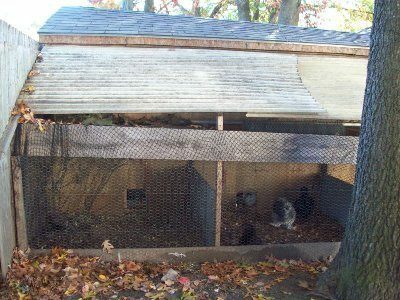 The other side has 4 pens with outdoor runs and the top 4 cages we use for hens when they hatch chicks to seperate them out of the breeder pens. I am guessing here but i believe they are 4x4's. 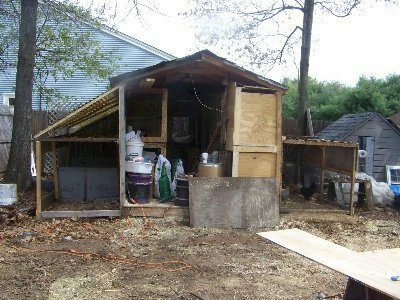 We tore off the front of this coop and attached the new coop right to it. 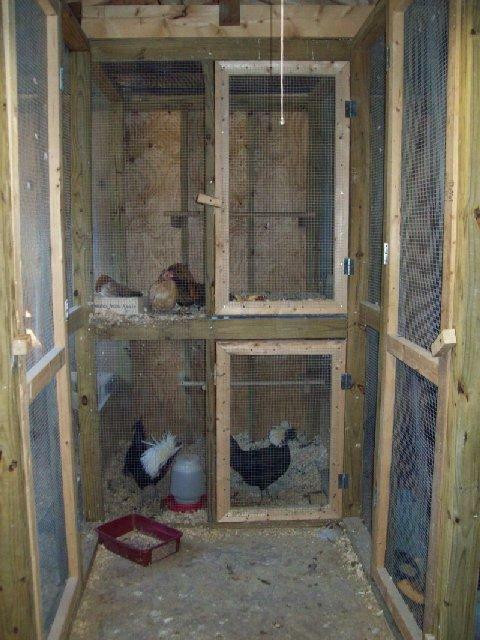 The old coop 10x14 the inside pens on the left are 3 on 3 2x3. 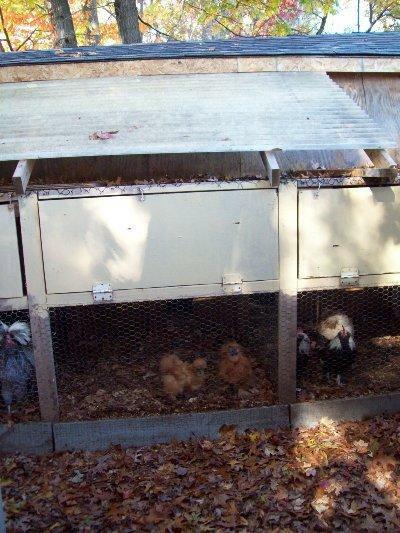 On the right, there are 4 on 4 they are 2x3 the outside runs off the bottom pens are 4x4x4's. We use these for breeder pens for pairs std or bantam trios. 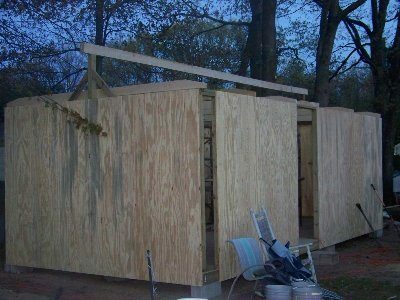 The new coop is 12x18. i looked all over for ideas before we built. we havent done the outside runs yet.they will be on the ends of both sides. a girl can dream!! 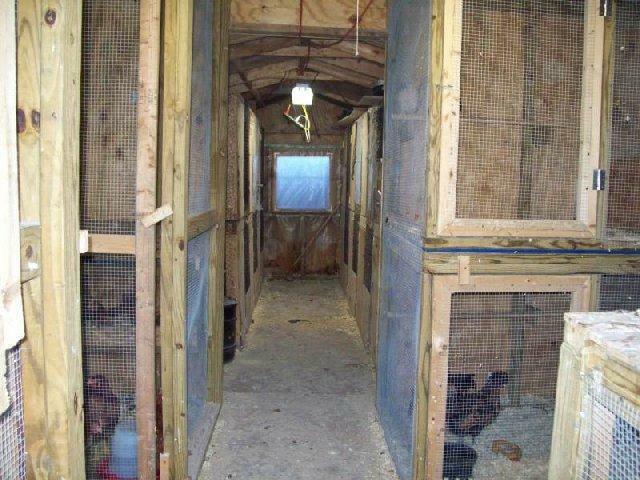 One of these pictures is looking threw to the back into the old coop. 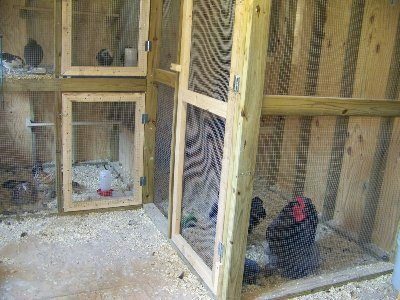 The pens in the new coop are: to the left there are 2 4x8s and in the middle are 2 4x4 pens; to the right are on one side a 4x4 and a 4x8 pen on top and 3 4x4 pens on the bottom; on the other side are 3 4x4 pens and on top is just a shelf right now. 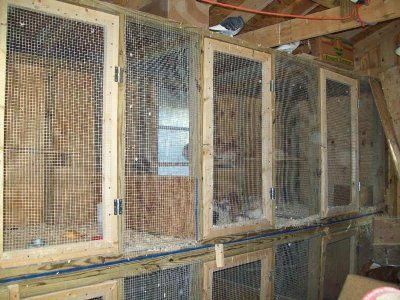 We planned to put another large cage there but havent yet decided. 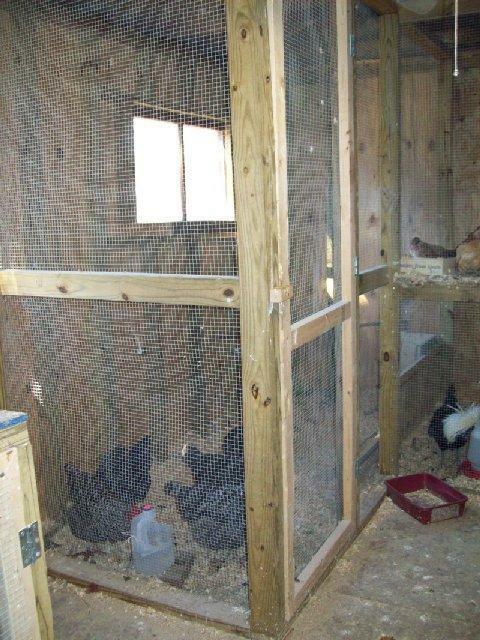 all pens are seperated by a half wood wall with wire that can be removed to make a large cage if you wanted. What would i change - I would have the large double barn doors. 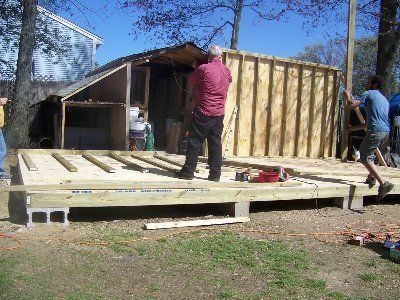 (which i still plan to do, just need to get a carpenter on board with my idea's!!). I really wanted the gambrel style roof. maybe next time! 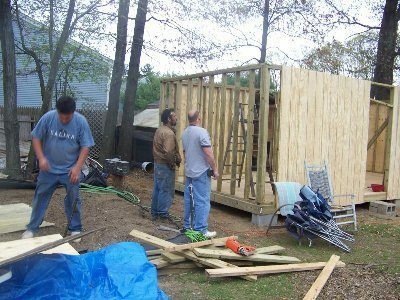 Laying boxes are located in one of the 4x8 pens. 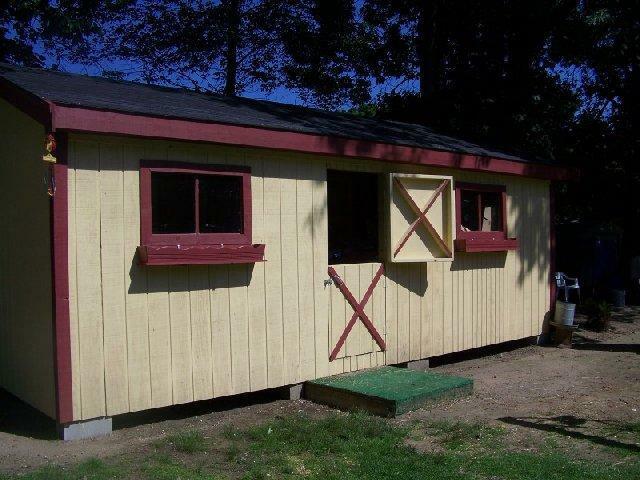 and this is the finished coop. When i ever get my outside run i will update this page. Fingers crossed for the spring! "I agree great breeder set up!" i love the concept, the pictures are great. It was a little confusing trying to match the pictures with the words. Do you have grow out space for hatchlings? Where do you keep the birds for swap? "Did it ever get the pens?" Would have liked more pictures. The descriptions were difficult to understand until the picture showing that they are basically stacked cages. You seriously need to let those chickens outside. You should be ashamed of yourself. I love your setup. 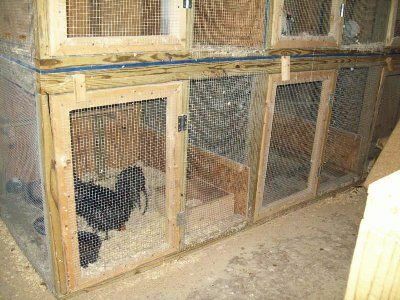 Plenty of brooder space, not to mention 2 levels of breeding pens. 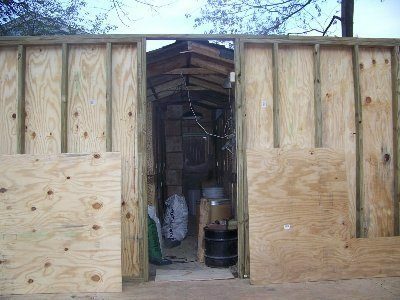 So when will C and Tony be here to build me one?? ?